ifiGOURMET was on a mission to find the greatest filled and frozen eclairs to add to their frozen product line up for 2019. However, after much research and many taste tests, it was determined that no one's eclairs stood up to our high expectations and quality requirements. So...we decided to create our own. ifiGOURMET now offers 9 all-natural flavors of buttery, French, and creamy eclairs. Flavor options include: Vanilla, Chocolate, Espresso, Chocolate Raspberry, Chocolate Peanut Butter, Peanut Butter and Jelly, Strawberries and Cream, Pistachio Mascarpone, and Bananas Foster. In honor of this delicious product launch, we want to show you how incredibly versatile these eclairs are in: your in-store bakery, your patisserie, and your high-end restaurants. Place in your pastry case exactly how they are and showcase their natural beauty! These eclairs are perfect for instore bakeries that go through products fast-simply put them in the case and watch them fly off the shelves based on their taste alone. Have a bit of time? Top an espresso eclair with a mocha bean or pipe on some frosting and place a raspberry on top of the chocolate raspberry eclair. A time saver, simple, and delicious. Option 1: How they come. Pictured Left: Classic Vanilla Eclair with Dark Chocolate Ganache. Option 2: A little garnish. Pictured Middle: Espresso Eclair with Dark Chocolate Ganache topped with Mocha Beans covered in Brilliant Powder. Pictured Right: Chocolate Raspberry Eclair with Dark Chocolate Ganache, topped with raspberry flavored mousse and raspberry pieces. Aching to decorate? If you're a patisserie, bakery, or café that enjoys a personalized touch, give the eclairs your own creative spin. Top with icing, mousse, fruit, chocolate décor, and more to elevate the eclair to new heights. Pictured Left: Espresso, Vanilla, and Chocolate Raspberry Eclairs with Dark Chocolate Ganache. Espresso: Topped with Chocolate Mousse, Mocha Beans, Cocoa Powder, and Chocolate Microdrops. Vanilla: Topped with vanilla flavored mousse, a Chocolate Pencil, and Mini Chocolate Stars. Chocolate Raspberry: Topped with dollops of raspberry flavored mousse and raspberries. Pictured Right: Peanut Butter and Jelly Eclair with Strawberry Ganache, topped with strawberries, peanuts, and strawberry flavored mousse. 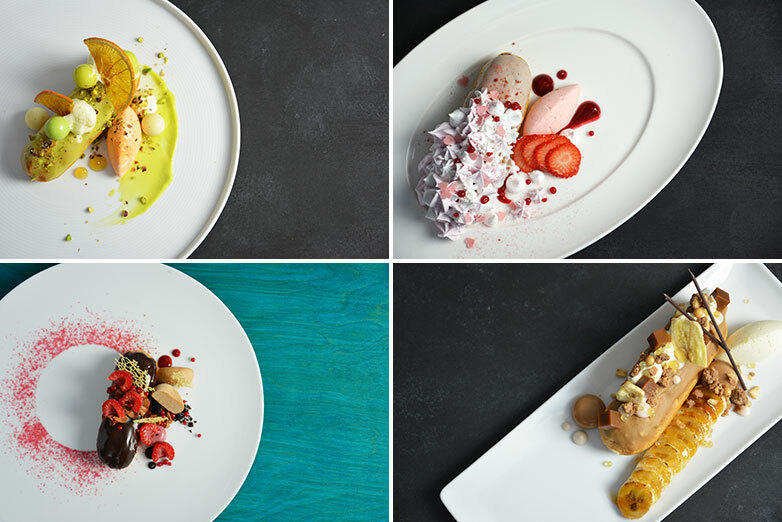 The eclair is the perfect starting point for a plated dessert masterpiece at your restaurant, hotel, casino, or higher-end dining. Jamie Caudy, the Executive Pastry Chef at the Ritz Carlton in Chicago says that "[The job] is easy when half of [the dessert] is done already!" when she used the eclair as a base for her plated pieces. Save time on the basics and let your creative genes flow as you top with fruit, mousse, 3-dimensional molds, purees, and more. Option 4: Gourmet Plated Dessert. Pictured Top Left: Pistachio Mascarpone Eclair with pistachio flavored White Chocolate Ganache, topped with Candied Orange Slices, pistachio flavored mousse molds, pistachio puree, and pistachio crumbles. Pictured Top Right: Strawberries and Cream Eclair with Strawberry Ganache, topped with meringue, Mini Chocolate Hearts, a strawberry puree, and strawberry slices. Picture Bottom Right: Bananas Foster Eclair with Caramel Ganache, topped with caramel pieces, banana chips, chocolate spears, White Chocolate and Salted Caramel Crispearls, and caramelized banana slices. Pictured Bottom Left: Chocolate Raspberry Eclair with Dark Chocolate Ganache, topped with raspberry pieces, raspberry puree, mousse molds, and powdered colorant. In order to fulfil our mission of having the most delicious, all-natural filled and frozen eclair, we had to create our own. We are proud to say that we love all 9 flavors and believe they are functional on every business level: in-store bakeries, patisseries, and high-end dining establishments. Regardless of your business and your customer base, these eclairs are sure to be an unforgettable addition. How will you use them?